I had my first ride today using the new Garmin 810. I found the set-up was very easy. Garmin 810 like its predecessor is all touch screen commands except for Power, Lap and Start/Stop which are buttons. I just tapped through the different menus and was ready to ride in fewer than 5 minutes. The bike set-up was really simple. I have an SRM Dura-Ace Crankset Power Meter. The Garmin 810 found the Suunto Speed sensor and the SRM power meter with ease. I then did a search for my Heart Rate strap and bam! all sensors were detected. People laugh at me because I name by bikes. Ok then why when I was doing the bike set-up did the Garmin 810 have an option to name by bike? You’re not going to put something boring like “Road bike” or “MTB” or “Serotta” in there are you? No! You have these little icons to choose from that are silhouettes of bikes. If you do that then you can see if it’s your road bike or MTB. 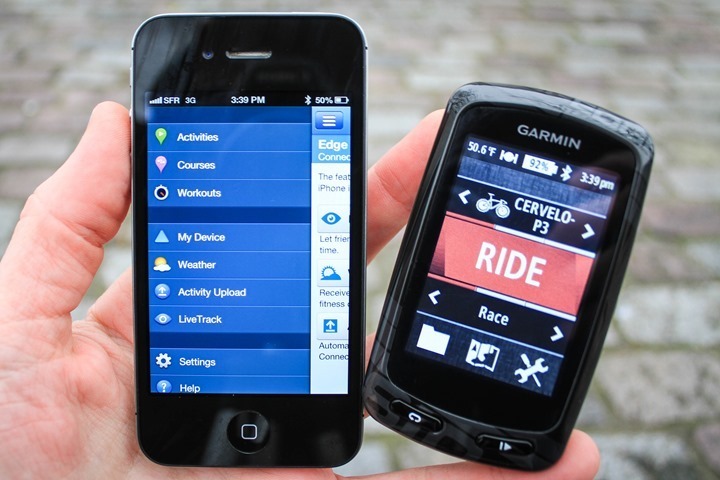 No, the very smart people at Garmin are giving you the option to NAME you bike! So do it it’s ok.
Once you get the basic sensors from your bike detected by your head unit it’s time to have some fun. One of the cool upgrade feature of the new Garmin 810 from the Garmin 800 is Live Tracking. Pair up your Garmin 810 to your smartphone via Bluetooth technology and now you can invite friends to follow you on your ride. You can choose selected friends by inserting their emails into the Garmin Connect mobile app or simply turn on Facebook or Twitter and have ALL your “friends” follow you. Watch the video below so you can see how it works. Tomorrow 1/19/13 I will be doing a century plus ride and if you’re my Facebook friend you can follow me through some of San Diego’s great country roads. My latest endeavor is forming a new and completely different cycling organization. REV Endurance Cycling Team – a cycling organization focused on bringing up the next generation of endurance cyclists. REV is a development team rather than a racing team. As part of it’s rider development strategy, REV is very keen on bringing more women into Ultra Cycling. REV is about making and maintaining a lifestyle change with personal health, fitness and cycling as priorities. REV will take the “couch potatoes” coach and train them to complete their very first century or Gran Fondo. REV will take century riders and assist them in becoming brevet riders (unsupported events) or double century riders. REV will prepare you for “the toughest 48 hours in sport”, the Furnace Creek 508. REV Endurance Cycling is always looking for corporate sponsors and individual donations. Please feel free to contact me with your interest in assisting REV Endurance Cycling accomplish its goals. This entry was posted in Endurance Rides, product review by REV Cycling Directeur Sportif. Bookmark the permalink.